Bring order to garages, basements, and attics with the rugged design and unique features of the Industrial Tote line. Be confident that stored items will stay protected in the durable 40 Gallon Wheeled Industrial Tote, the ideal portable solution for storing larger and heavier supplies. 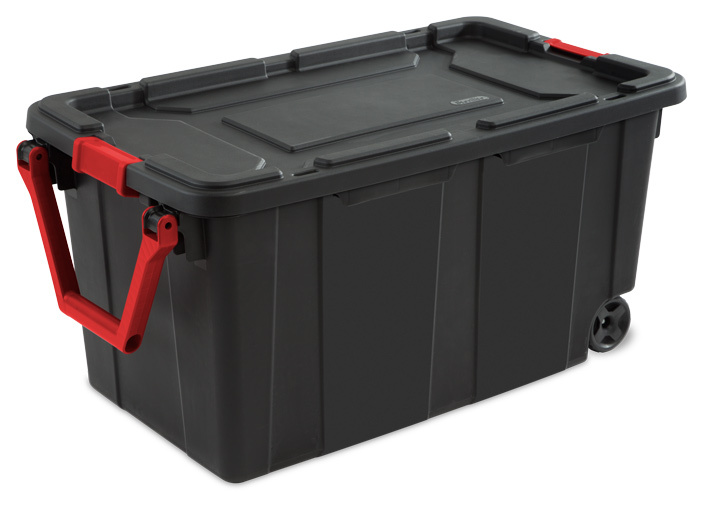 The grooved lid design and keyholes provide options for tie-downs to simplify transportation, and keep totes in place in the back of a pick-up truck. The ergonomic handle rotates up for easy pulling while the large wheels and metal axle allow for rolling over rough surfaces. The innovative drip-resistant lid provides maximum protection against items getting wet, while the tight-fit lid keeps items contained. The robust latches offer extra security that the lid will stay attached to the base, and the textured surface makes for a sure grip when carrying. The deep recessed lids provide stability when stacking for efficient use of storage space. Channeled walls provide added strength and help to resist crushing under heavier loads. 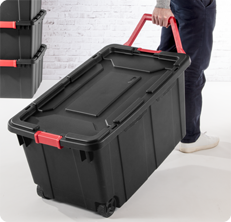 The 40 Gallon Wheeled Industrial Tote is ideal for more active storage needs, store camping equipment, sports gear, tools and workshop supplies, and other bulky items. The overall assembled dimensions for this item are 36 3/4" x 21 3/8" x 18". 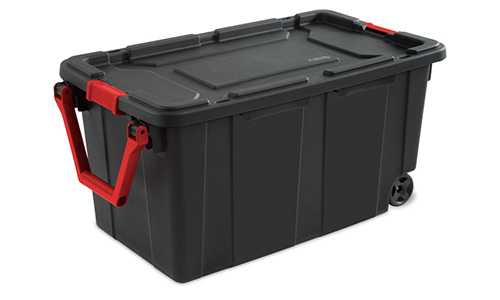 Overall Assembled Size: 36 3/4" x 21 3/8" x 18"
The ideal portable solution for storing larger and heavier supplies. 40 Gallon Wheeled Industrial Tote is rated 3.8 out of 5 by 11. Rated 4 out of 5 by daballe53 from NEED NEW LIDS I purchased 4 of these totes for a recent move. Unfortunately, 3 of the 4 lids were cracked and broken during the move. Is it possible to purchase lids only? I do like the size and usefulness of the item, just want new lids! Rated 5 out of 5 by TravelGem26 from Make More Colors!!! These totes are the greatest! I do a lot of adventurous stuff with my husband. We go camping, scuba diving, and skiing. These totes are great for keeping more storage completely organized. It makes it easier for us to quickly go on a trip. All we have to do is pick up the tub and go on our way. It's really great for camping because, once it rained really hard and everything inside stayed dry. My only request is to make a few different colors, so blue could be for scuba diving, white for skiing whatever. If I could dream, I would also request a customized color tub, or if you had cool exotic colors & patterns. Thanks!!! Rated 5 out of 5 by Chattfly from Best tote I've ever used. I keep all of my fly fishing gear in the 40 Gallon Wheeled Industrial Tote in the bed of my truck, which I'm constantly taking in & out & it has outperformed any if its predecessors. It's very sturdy, attractive & I love the large, easy to use handle. Rated 5 out of 5 by CollegeMom from Great for moving to and from the dorm I own six of these and I love them! I purchased them to move my son to and from his college dorm. I love that the totes have wheels and a handle. I haven't experienced any of the problems others have identified. The handles and lids are as good as new. No cracks, no breaks, no damage; even after being fully packed and pulled up and down the stairs, and then stacked one on top of the other in the back of the SUV. We even sat on them while taking a break on moving day! My only "complaint" is I wish the handle was longer. I'm only 5'3" and I have relatively short arms. So, using the handle to pull the tote is a bit awkward, but still manageable. When the totes are empty, you can "nest" them, one inside the other (without the lids). When the lids are on, they stack easily. Rated 1 out of 5 by Stacy from Poor quality I purchased two 40 Gallon Totes and planned to buy more but issues with them has prevented this. I purchased two of them from a huge retailer and noticed one of them was cracked/broken on the handle at the hinge. I just thought it was a fluke so I just had my wife take it back and exchange for another one (I actually told her to purchase three which I was glad they only had one left after all). I just inspected the handles and notices that again at the hinge their was a bit of white discoloration near the hinge as if it had been stressed. At closer inspection the red handle was not cracked but there is a white spot and a crack in the black plastic where the handle connects to the box. Not sure what is going on but too much of a trend to think there might not be an issue in design. I tried to find a number to call Sterilite to discuss what is up prior to posting this but could not find one. I will be very interested to see if they prevent its posting. Rated 2 out of 5 by Chino from Lids to weak I brought 6 each not to long ago and lids already cracked on side a must replaced? Do you guys sell replacement lids?